Simply put, we provide custom qualitative research on retail brands that answer the questions you need to manage your needs. We have a proven methodology that aligns our data gathering to the brands you follow and track how they are poised to perform in current seasons and for the long haul. Insights and opinions are published in custom, monthly and quarterly reports. Contact us for more details. We kick off the process understanding the tickers and questions that drive your decision-making. Then we deploy a team of industry-leading experts (and query key demographic members) to quantify the brands and trends that affect results. We determine report timing, frequency and depth of coverage based on client need. Past reports have detailed leading brands in the aspirational luxury space with specific reporting on handbags and watches, as well as macro trends driving results during key shopping moments such as Back-To-School or Black Friday weekend. 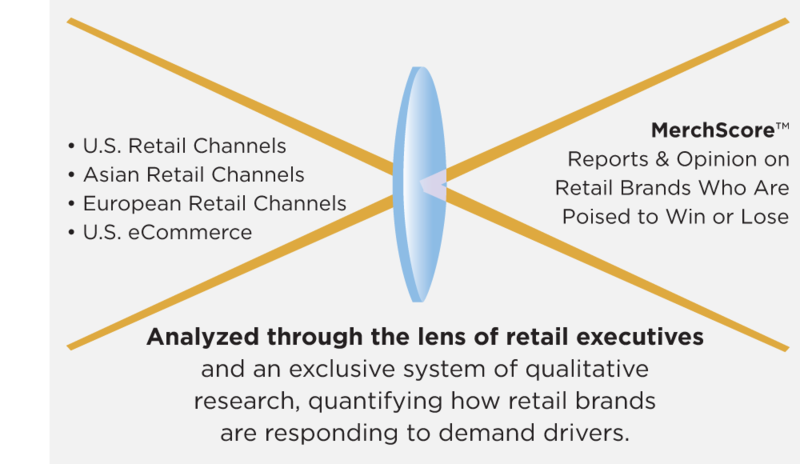 We combine observations and analysis from U.S. retail, Asian retail and digital channels—including e-commerce, social media and digital marketing—to provide a unique perspective on retail brands. We bring the expertise from decades of experience from retail executives and a merchandising perspective to understand what drives demand, who is implementing it well, and ultimately who we think will drive results. The analysis is presented in a full written report as well as a MerchScore for each brand that encapsulates our opinion. Mary Epner leads a unique team of former retail executives who report on retail brands across the U.S., Asia and on digital platforms. Each team member has, on average, over 20 years of experience in retail management, merchandising or channel expertise. They hale from luxury to discount retailers, department stores, wholesale brands and have category expertise that includes men’s and women’s apparel, cosmetics, handbags and accessories, shoes, watches athletic, plus more. A team of former executives that have run small ($50 million) to large ($1B or more) businesses. Find out how Mary Epner and her team can create the right custom report to complement your needs.